I recently posted about the fabrics of the Weiner Werkstatte (Vienna Workshop). 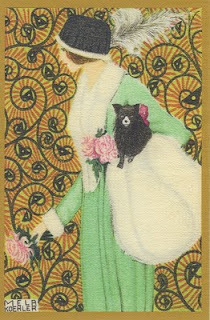 Many of the designers participated in their Post Card Project....almost 1,000 different post card designs between 1907-1920. I have new Vintage Images showing 5 of Mela Koehler's post card designs. I love her dogs and wallpapers! This weekend, I am in Minneapolis for Easter with my daughter and her family. Monday morning I leave for Paducah to stay with my friend, Judy Schwender, Curator of Textiles at the National Quilt Museum, attend (for the first time) Appraiser's School and see the show! Then back to Montana to hopefully 'get out into the garden' and start on more images for the Chintz Center Panel project. Was in Vienna in September 2009 - beautiful city and lots of wonderful things to see including Klimt's paintings. Didn't see half of what I wanted. Must go again..